This kit fits Fox Body Mustangs and includes everything you need to give that aggressive look to your Mustang. You can bullet-proof all of your hoses with this one kit! 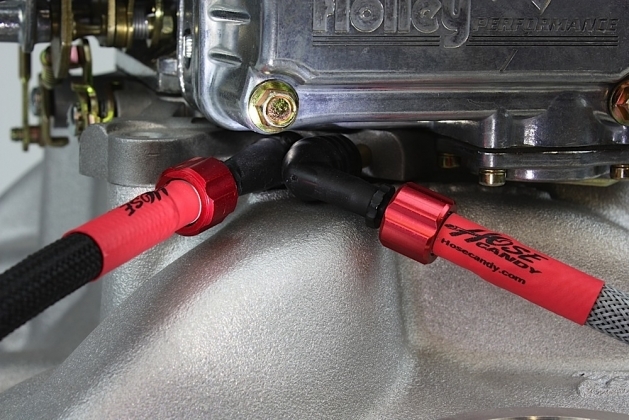 Hose Candy Kits provide the ultimate in custom styling and enhanced performance. This Hot Rod Kit includes Boa Clamps, Hose Skins, Sidewinders and Performance Silicone Hose that have been packaged to have the sizes and lengths for your vehicle. For the right fit, there is no “one size fits all”. You'll need and want a kit sized just for your vehicle which will make installation a breeze. You have a choice on your Skin Color: Black/Black, Blue/Black, Red/Black, Green/Black, Yellow/Black, Orange/Black and on your CNC Sidewinder Color: Black, Blue, Red, Silver, Green, Purple, Gold. The new Carbon Fiber and Kevlar Hose Skins feature a proprietary weave and coating system called SkinPosite making it now possible for DIY users to “skin” their own hoses in their shop or garage. Prior to the release of Hose Skins with SkinPosite technology, it was not possible for DIY users to effectively install high tech fibers like carbon fiber or Kevlar over hoses, it had to be done by the manufacturer. SkinPosite technology solves several problems when working with high tech fibers: it makes them quick and simple to install, keeps the fiber pattern aligned, conforms to tight bends without “bunching”, prevents the fibers from getting the “fuzzy” look or from catching on sharp objects and they look amazing. Hose Skins can be ordered in straight carbon fiber black, Kevlar yellow or carbon/Kevlar hybrid in custom colors like: black/yellow, black/orange, black/blue, black/red, black/green and more. Turn traditional vacuum or turbo hoses into quick couplers minimizing leaks, making them quick and easy to connect or disconnect and look amazing. he Sidewinders come in several flavors, that contain basically the same parts, but differ in the number of parts included. Replacing your car's vacuum or turbo hoses with silicone hoses will help eliminate power robbing vacuum leaks. Silicone performs much better than standard rubber hoses at high temperature. Our silicone hose is rated as high as 500 Deg F. and will not get hard and brittle like traditional hose. Hose Candy Silicone Hose Kits feature the highest performance silicone hose available and should last the life of your car. Silicone Hose in combination with Hose Candy Sidewinder Kits are one of the best upgrades you can buy for your car. The use of Hose Candy Sidewinders will turn all your hose connections into quick-couplers and that means you never bust your knuckles again prying the hose off the barb.